A traditional Thai Spirit House receives gifts, garlands, and prayers from the Thai community. 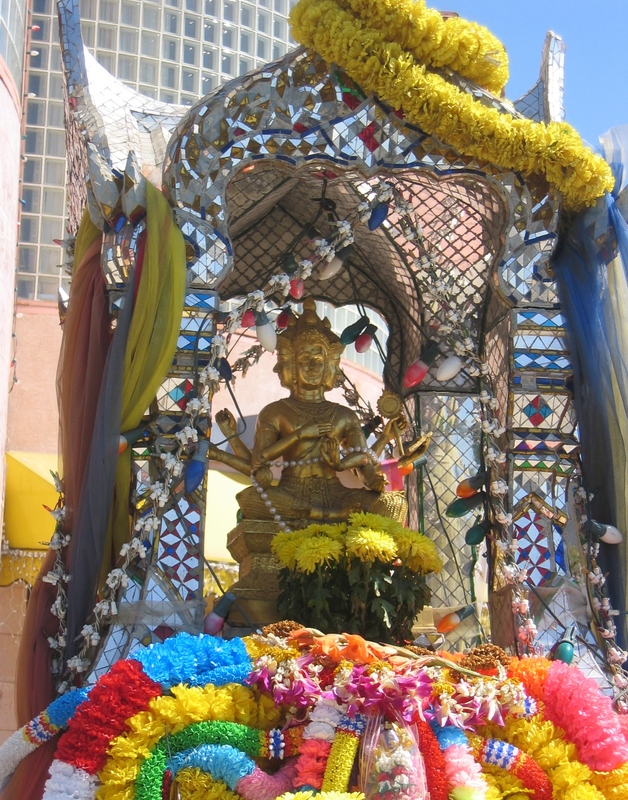 This spirit house, a mosaic of glass and tile, is one of two located within Thai Town in Los Angeles. The East Hollywood area of Los Angeles has served as the historic point of entry for Thais since 1965 and has become a major cultural and economic hub through a concentration of bilingual services, jobs, and family connections. Thai Town became an officially designated ethnic neighborhood in Los Angeles on October 27, 1999. About 10,000 Thais live in the neighborhood. Los Angeles County is home to the largest number of Thais outside of Thailand, estimated to be around 50,000. It is the only officially recognized Thai town in the United States. Thai Town, which runs along Hollywood Boulevard from Normandie to Western avenues, is home to about 46 Thai businesses, including silk shops, bookstores, and restaurants. Thai Town is the site of several historic Los Angeles buildings, such as the Don Carlos Apartments, Trianon Apartments, and the Mayer Building on Hollywood and Western. Thai Town is led by the Thai Community Development Center (CDC), which seeks to foster tourism to the community for the benefit of business owners in the area and to establish this relatively small commercial center as a cultural haven. Thai CDC is committed to protecting historic properties through adaptive reuse. In a joint venture with One Company, they invested $5 million in the rehabilitation of the Halifax Apartments in Hollywood. Built in 1923, it was a former celebrity hotel but suffered neglect and slum-like conditions for years. The Thai CDC and One Company renovated 72 singles into 46 affordable multi-family units. The Thai Town Gateway Project showed the Thai CDC working in partnership with the city of Los Angeles and dozens of private businesses to install two Thai angel statues at the intersection of Hollywood Boulevard and Western Avenue, a gateway to Thai Town, as well as another two at the eastern end of Thai Town. The statues depict “Apsonsi” a mythical half human-half lion creature that is said to protect and bring good luck. The project had wide support as a way to promote cultural tourism and economic development. The East Hollywood Streetscape Project also is coming to fruition after a Thai Town proposal. Working with the city of Los Angeles, the comprehensive streetscape project along a one-mile stretch of Hollywood Boulevard plans to incorporate Thai-style street lamps, banners, and other design elements to highlight Thai Town. The annual Thai New Year’s Day Songkran Festival brings together Thais and visitors for a day of Thai culture, food, and entertainment. In April 2008, more than 100,000 people attended the fifth anniversary of the festival—a tenfold increase in the five years since the tradition began. A Thai Town 5K run/walk fund-raiser kicked off the event, and the first L.A. Curry Festival showcased curry dishes from Japan, India, and Thailand. An annual Thai Cultural Day marks its 16th anniversary this year. LA Commons, a nonprofit organization that promotes neighborhoods through art and culture, has started walking tours through the area. One of its projects features Thai Town as one of the most interesting cultural destinations in their “Trekking Los Angeles: Local Adventures in a Global City” guidebook. This project gives visitors and locals the chance to experience the city’s diversity while supporting local economies in places where culture is a highly valuable asset.